Reginald C. Dent enlisted in His service at the age of 16. He served one tour of duty in the Mordian Home Guard, and then was transferred to the Mordian 501st Regiment, wherein he saw action for three and a half years in the defence of the hive world of Starrax against an Ork Waaagh! In the aftermath of this war, the decimated 501st was reassigned to system defence duty. During this time, Dent served in a boarding party aboard the light cruiser HMMS (His Majesty’s Mordian Ship) Triumvirate for nine years, of which a total of almost five were spent within the warp. He participated in five aggressive boarding actions (three against Chaos raiders, one against an Ork Rokk and one against a Eldar cruiser) and defended against fifteen assaults in close proximity to the Mordian system. Eventually, he rose to the rank of Master-sergeant. He became well known for his skill with a lasgun, and often preferred it to the more common boarding shotgun used by boarding party units. He became quite well known for his sharp shooting, even when under fire. At the age of 22, Dent was transferred to the compliance garrison on Tomak III, an industrial plant not unlike the world Armageddon had been, before the Orks had fallen upon it like the fist of an angry god. It was on the planet’s secondary hive where he served almost a year as a drill sergeant for before making the single biggest mistake of his career. At roll call one morning, a group of three privates from the Tomak PDF came in looking “slovenly and unkempt,” as he would describe in his incident report. Dent gave the three men a stern dressing down and placed them on KP duty for a week. Out of habit, he later passed by the canteen to check up on his punishment detail. What he saw was two of the men he had sent down there, and some unrelated warrant officer Dent had never seen before. Upon investigation, he discovered that this warrant officer had somehow been assigned in the third private’s stead. Dent was furious. He stormed into the barracks where his charges were quartered and raised bloody hell, shouting, cussing and demanding all manner of justification for just HOW this private had countermanded his orders. The private in question was belligerent and terse. He told Dent that the Mordian didn’t have the right to give him orders, and the fact that he HAD issued a punishment detail at all was (according to this insolent whelp) grounds enough to have him demoted, should he bring the matter to the local aristocracy. Dent would have none of it. He bellowed that under his command, his word was law. Only the Inquisition or the Emperor himself would countermand his will. Unfortunately, this was not the case. The private in question was fourth in line for the planetary governorship– a detail indicated in the man’s paperwork, but something Dent had not considered at any point during these proceedings. It took only one letter, and 72 hours for the full weight of Dent’s mistake to become manifest. Due to his record, and awards for bravery in the face of the enemy many years prior, the request of the planetary governor to have Dent publicly executed was denied. Instead, Reginald was drummed out of the Guard, given a dishonourable discharge and sent, penniless and alone, into a world he did not know, a disgraced man. For 5 more years, Dent drifted from port to port, world to world. He took jobs on freighters and civilian transports to make ends meet. It was on a lonely Feast of the Emperor’s Ascension, where he sat drinking in some ale house on some Emperor forsaken space dock above the least relevant colony, seemingly, in the subsector, that he met a man. A man who offered to clear his tab. An offer the drunken, dejected Dent failed to refuse. When he awoke that Feast Day morning he was on a ship he did not recognize surrounded by many of the reprobates he had been drinking among the night before. He had accepted the Purser’s shilling. He now owed the ship, and his new Captain, service. While most of his hungover cohorts attempted to bargain their way out of their predicament, Reginald C. Dent saw it as a new beginning. -Dent still carries his Guard-issue lasgun, which he has since modified and maintained to excellent quality. Furthermore, he still has and wears his old Iron Guard uniform, which he diligently keeps pressed and spotless. -In addition to his lasgun, Dent is typically armed with an Ork choppa he took as a trophy from the battlefields of Starrax. It is a crude melee weapon he uses, not only to prove his might in combat, but to put fear into the hearts of Orks as he kills them. He knows that Orks see Humans as weak, and incapable of using Ork weapons. Dent loves the incongruity of his impeccable uniform against the garish axe, slung over his shoulder like a woodcutter`s tool. Celatara appeared on a human world that was being consumed by the Tyranids, armed only with a blade and dressed in her funeral shroud. She looked up at a slate-grey sky, the clouds roiled like waves. Her eyes tracked down to the seething mass of limbs and claws surging forward with a single will toward her. She draw her sword and saluted the mass. The sword stabs into the ground, ichor falling off it in thick globs. Celatara follows it, her head hanging low, the sweat dripping off her and mixing with the ichor. She leaning forward on the hilt, resting her weight on the barely crackling blade. A cry of a living child interrupted her, jerking her head toward the sound. “Cygnis” Celatra interrupted. Where did that come from? She steps back and feels a strand move under her heel. The Lictor rises behind her, Celatra reaches for her sword as she turns her head. But her hand closes around nothing. She looks down in shock, the Lictor rearing back to strike as she stands conflicted. Celatra moves but the claw continues to her head, the child’s head tucked into her chest. The claw falls toward them, like a harvester’s scythe. It slices: grey dye, cured leather, and that was all. The claw lands in the ground shaking, riddled with cracks. It snaps like a dry branch, and the Lictor draws back the destroyed limb, roaring its pain. Cygnis’ hand held out, open, towards the creature to push it back. Celatra put her hand down as she jumps away from her opponent. Her feet scrapes along the broken bits of brick and metal in the ruins. She ran hard as the Lictor roared again, charging toward her. Celatara’s hand closes around the hilt barely in time. She turned to slice through the monster’s thick hide. It slumps to the ground in pieces. Celatara pants for air staring at the still quivering half of the monster. It’s dead, and she… Celatara looks down at the girl. The young woman known Cygnis was found by the Eldar Corsair Prince Celatara when she was only 4 or 5 years old. A foundling left orphaned on her world by a Tyranid attack, Cygnis was found and rescued by Celetara, though the Corsair’s motivations have never been clear– perhaps Celatara was moved by the mon-keigh girl’s plight, perhaps she sought to heal the wound caused by the death of her own family, or perhaps Celatara sensed the raw psychic power that this human possessed. Whatever the reason, Celatara took hold of this young girl and retreated with her back through the webway, and back to the shelter of her flagship. Over the next few years, the girl grew up among the Corsair fleet, her presence disliked at first by the Eldar, but nonetheless tolerated because of the Corsair Prince’s strict command. At Celatara’s orders, Cygnis was taught the Eldar language, and under the tutelage of the flagship’s Void Dreamer, she was taught to hone, focus and use her psychic abilities, particularly in aid of navigating the ship. Over time, while the Corsairs continued to see Cygnis as a mon-keigh, and thus as inherently inferior, their attitudes towards her warmed somewhat– to them, this was proof, at least, that even the mon-keigh could be “civilized” by being taught Eldar ways. Whether Celatara ever shared their views, however, was unknown. One day, however, while Cygnis was meditating, she was woken violently by the sensation of the flagship suddenly translating out of warp. The next thing she knew, the ship began to shake as though it were under attack. At that moment, Celatara appeared, grabbed a hold of Cygnis, and told her that it was time for her to rejoin her own people, before pushing her through a teleportation matrix. When the flash of light subsided, Cygnis was standing on the soil of a human colony world, alone and abandoned. -Although she is human, Cygnis sees and thinks of herself as an Eldar. This is mainly because she was, for all intents and purposes, raised by the xenos and taught their language, customs and culture. Because of this, Cygnis always refers to her fellow crew as “mon-keigh,” and only has a passing familiarity with Imperial customs and traditions. 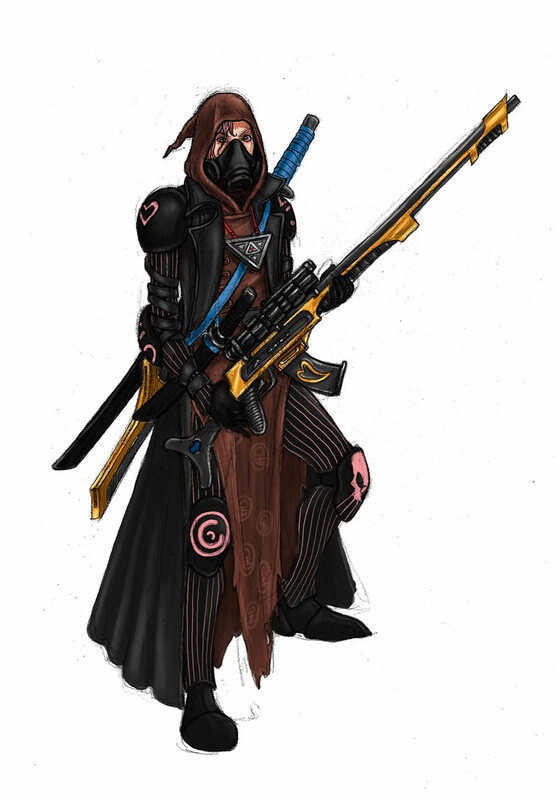 She reinforces this self-image of an Eldar by dressing in the cloak and of a Ranger and keeping her ears covered. To the common bystander, her appearance, manner and movements are all those of an Eldar, and only one who is well-studied on that xenos race, or who manages to see her with her hood lowered, would realize that she is in fact human. It is because she appears so alien, and willingly isolates herself from other humans, that her crewmates tend to view her with suspicion if not outright distrust– only the patronage of Captain Avalon ensures that she is tolerated aboard the Iron Duchess. -Cygnis carries several pieces of Eldar equipment on her person, not the least of which is a cameleoline cloak given to her by a Ranger she encountered in her travels. She also carries a shuriken pistol that she had on her when she was teleported off of Celatara’s ship, and a spirit stone that Celatara gave her when she was still young. Though it is uncertain whether a spirit stone could contain Cygnis’ soul in the event of her death, Cygnis nonetheless uses it as a focus for her psychic powers. Brigitte was born the first daughter of the L’Oiseaux dynasty, a prominent noble house upon the Imperial water-world of Tethys, and was marked from birth for leadership. Trained over the course of decades to eventually take command of House L’Oiseaux, she proved further excellence in achieving the seat of Planetary Governor and bringing Tethys further into the grace of Imperial society. Her first term in office saw marked improvements in tithing and trade, severe reduction in open heretical obeisance and the building of strong ties with all echelons of Imperial society. A successful appointment to a second term of leadership promised the elevation of the Tethysan way of life to an unheard-of level of peace and prosperity, if not a true golden age for the once-heretical and backwater planet. A mere four days after her appointment – not even long enough to complete the extensive celebrations such an occasion would warrant – Tethys found itself engulfed in a tendril of the Gyre and, to all available instruments, vanished into the Warp. It was by fortune alone that Brigitte was off-world at this time, having instead been commisserating with her valued peers of House Chasson upon their orbital seat of Voidthrone. Awakening aboard her sumptuous quarters to find that her hazy images of loss and madness had been more cruel reality than dream, she strove to put things to rights – only to discover that her once-allies of House Chasson had effectively confined her to house arrest under suspicion of cowardice and collusion with unclean forces. Not only had her home, her family, and her very planet been snatched out from under her, but Beauregard, the head of House Chasson, had used the disaster to entrap her for slights imagined in the distant past. Knowing that to remain on Voidthrone would be to practically accept interrogation and incarceration for manufactured crimes, Brigitte used her peerless guile and charm to manipulate an exit from her gilded cage and locate allies aboard the drifting and world-lorn station: the Iron Duchess. Captain Tiberius Avalon had been a trading partner in the past, and Brigitte successfully leveraged their relationship to earn a berth aboard the vessel and escape from the traitorous House. Now loose in an uncertain universe, Brigitte L’Oiseaux serves as Avalon’s High Factotum, bringing effective diplomacy and real prosperity to the noble Rogue Trader – and, at the same time, working to unite the disparate Tethysan refugees and recover as much as she can of her lost world. -Brigitte is often attended by her two servants– her sommelier, Amadeo, and her handmaiden, Soeur Kathima, both of whom are survivors of Tethys like herself. -Brigitte fervently believes that Tethys survived the warp storm, and remains pristine and unravaged by the Gyre. It is uncertain, however, if this is faith and optimism on her part, or a madness borne of desperation. -Brigitte has insisted upon writing her own biography. The techno-radical known as Magos Andromeda originally came from Mundus Brunnus (or simply “the Brown Planet” to the locals), a death world ravaged by radiation storms, large-scale pollution and a highly toxic atmosphere. Born into an isolated community of scavengers, Andromeda grew up exploring the remains of her world’s previous human civilization, and became fascinated with the archeotech contained within– particularly the still-functioning AI systems that the previous civilization had left behind. It was because of this fascination with technology that she joined the Adeptus Mechanicus, and, later, as a full-fledged Techpriest, returned to Mundus Brunnus as part of an official Explorator mission to recover archeotech from the planet. Upon her return to her homeworld, however, she found an Ecclesiarchy mission there, converting her people to the Imperial creed. Horrified by what she saw as the blind dogmatism and the fear of invention and innovation that the missionaries preached, Andromeda one day hacked the holo-pulpit the lead missionary was using to deliver a mass, and delivered a manifesto to the assembled congregation, urging her fellow Brunnians study and use the technology that they scavenged, and in particular, urging them not to fear artificial intelligence, declaring that the creation of thinking, self-aware machines like those used by their ancestors would help propel humankind to new heights of invention and technological mastery. Understandably, the fallout of that incident was catastrophic. The Ecclesiarchy declared her to be a blasphemer, while the Mechanicus eventually too formally accused her of tech-heresy and excommunicated her. Forced to flee, Andromeda found refuge on the Iron Duchess, and has since served as the ship’s resident archeotech expert. 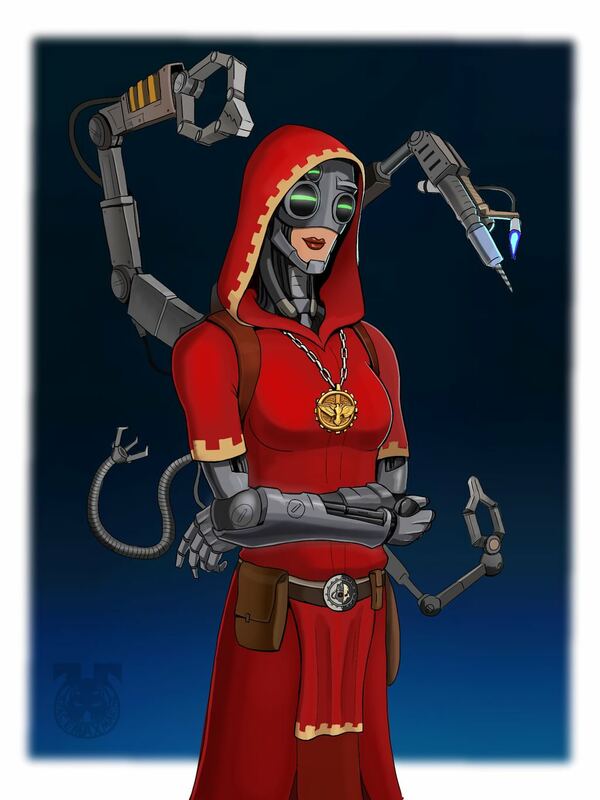 -Though she has paid lip service to the creed of the Mechanicus in the past and has, by necessity, had to memorize most of the prayers and rites of her order, Andromeda is at heart an atheist, and does not believe in the Machine God or in machine-spirits– to her, everything can be explained by rational scientific observation. Obviously, however, she has had to keep such heretical views hidden from her more dogmatic Techpriest brethren. -Andromeda’s two main cyber-implants consist of a mind-impulse unit embedded into her skull (from which dozens of extendable plugs flow out in place of natural hair), and a pair of bionic eyes fixed into place by permanently-attached metal goggles. The eyes were a replacement of necessity as well as convenience, for Andromeda had been partially blinded by the neglect of her parents back on Mundus Brunnus. Prior to her long exile into Gue’la space, Shas’ui Vior’la Ka’ra was a Fire Warrior who had already served with distinction on many battlefields, including Arkunasha and the battlefiels of the Damocles Crusade. Because of her stellar record, she was eventually chosen to join the expedition of the great hero, Commander Farsight…and years later, she would be one of the many Fire Warriors who renounced the Ethereals and pledged their loyalty to Farsight upon the foundation of the Farsight Enclaves. In the aftermath of the formation of the Enclaves, however, Ka’ra began to notice troubling things about Farsight– namely that his personality was slowly changing, that he was becoming more aggressive, authoritarian and tyrannical, and that the Enclaves were becoming more insular and militaristic. Never one to hold her tongue, Ka’ra spoke out openly against Farsight, decrying him as having become just as oppressive as the Ethereals, or worse, as having become possessed by whatever malign influence powered the Dawn Blade. In response, she was imprisoned, and, pending a decision of her punishment, was put into cryo-stasis indefinitely. Fate, however, had other ideas. Some time after she was frozen, Ka’ra’s cryostasis was interrupted when the world she was on came under attack by an unknown enemy. Ejected from her cryo-pod, Ka’ra managed to slip away in the ensuing chaos and steal a shuttle, managing to escape the planet and ultimately flee the Farsight Enclaves. After years of drifting through Imperial space, disguising herself where possible, Ka’ra met Tiberius Avalon, who, upon discerning that she was a T’au, did not report her to the authorities but rather offered her a place on his ship– as a man dealing with xenos technology, he told her, he needed someone who knew what that technology did and how to operate it. And so Shas Ka’ra joined the crew of the Iron Duchess, a renegade to both the Empire and the Enclaves…though she still yearns one day to return to the T’au Empire and be with her people once more. -Before her imprisonment, Ka’ra was often accompanied by her two faithful Gun Drones, Ex and Vee. Their core personalities remain uploaded into Ka’ra’s neural implant, allowing them to converse with her…and annoy her…without the need of physical bodies. -At some point in her career, Ka’ra lost her entire squad. 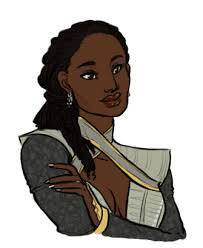 The loss of her bond-mates took a heavy toll on her, and even before her exile, she acted in isolation as a Mon’at. 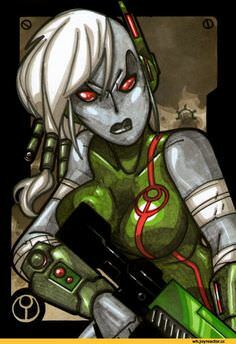 -Ka’ra was able to take very little equipment with her when she escaped from the Enclaves, aside from a pulse pistol and ammunition. Bereft of typical T’au armour, she has instead been forced to rely on whatever she could barter or scavenge. She presently wears a suit of battered, second-hand Guard flak armour, and whatever human weapons she uses have been ergonomically altered to suit her four-digited fingers. On human-dominated worlds, she keeps her true nature hidden by concealing her features behind a heavy gas mask. The only part of her facade that she has difficulty with are her feet, as human foot ware is not designed to accommodate cloven T’au feet. This entry was posted in Rogue Trader, RPGs, Warhammer 40k and tagged Fluff, Rogue Trader, RPGs, T'au Empire, Warhammer 40k. Bookmark the permalink.